What's the ROI of an HR Hero subscription? Take this quiz to find out if HR Hero is right for you. On average how many hours does it take you to research, write employment law issues, employee handbook updates, and/or job descriptions? Do you use an outside consultant*? *Outside consultants are used by many employers to review a company's HR Policies to ensure that they are in compliance with state and federal law. Outside consultants can also be used as a means to outsource certain HR functions including but not limited to writing job description, creating employee handbooks and more. 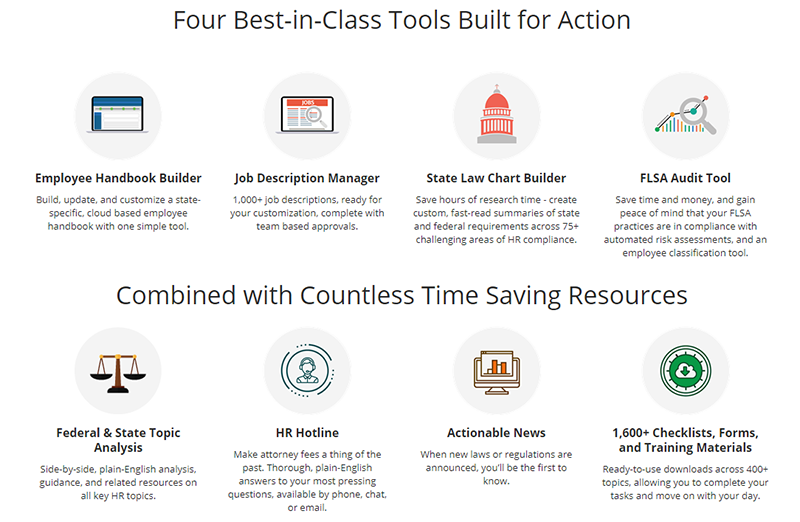 HR Hero has four best-in-class tools built for action. Including Employee Handbook Builder, Job Description Manager, State Law Chart Builder, and FLSA Audit Tool. Do you use an outside attorney*? *Outside attorneys are used by many employers to review a company's HR Policies to ensure that they are in compliance with state and federal law. Outside attorneys can also be used as a means to outsource certain HR functions including but not limited to writing job description, creating employee handbooks and more. Which of the following is part of your current job responsibility?